Truth: putting green concealer on your zits can do wonders. If you follow makeup artists on Instagram or turn the pages of any beauty magazine, chances are you’ll find a tutorial on color correcting, a much buzzed about new trend that involves wearing concealer in every shade of the rainbow. Turns out putting purple concealer on your face isn’t an act of madness but rather an ingenious way to hide blemishes. Here’s how to apply color correcting concealer to hide your perfectly cute imperfections. Color correcting is a concealer technique that professional makeup artists have used for years and that went mainstream after social media got wind of the trend. Here, the color wheel determines which color of concealer will work best on your blemish. Colors that are opposite of one another on the color wheel cancel each other out. 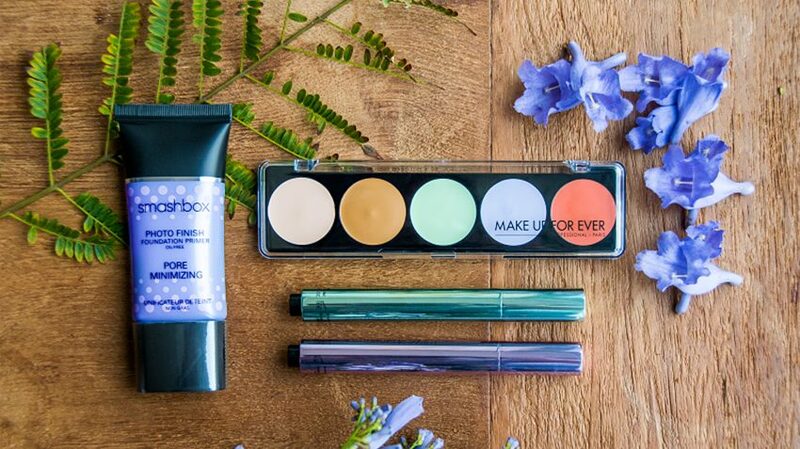 Green concealer cancels out red zits, purple concealer minimizes yellow spots, and orange concealer takes care of blue dark circles. If you apply this theory, then you can make your concealer work better for you. Use the appropriate hue to cover blemishes, then lightly pat your foundation on over the color. When covering dark eye circles with orange or pink, apply your regular concealer over the bright pigments, then tap the makeup down with a beauty blender. Take a peek at makeup guru Carli Bybel’s stunning tutorial, which begins at the 9:45 mark. Watch how she turns her rainbow look into a flawless finish. Orange is opposite from blue. If you have darker skin with blue dark circles, orange will work to help conceal the uneven undertones. People with lighter skin should avoid orange and instead use a peach color corrector. Do choose the right hues for your skin. The effectiveness of color correctors depends on finding the right tone to match your blemish. Remember that orange is for dark skin and peach is for light skin. Do apply thin layers! A thick layer of corrector may show through your foundation. Do utilize a makeup sponge or beauty blender to pat the coverage into the skin. Don’t brush the colors all over your face. This will undo all the hard work you’ve done by moving the pigments into the wrong areas. Do remember that makeup should enhance your skin not hide it! So think of color correcting concealer as a fun extra step that’s to be used sparingly and don’t forget to let your natural face shine. Thank you soooo much!!!!! This article has really helped me a lot!!! Since they’re white, a colored concealer may not be the best option. Try applying self-tanner with a cosmetic brush or just a concealer that matches your skin tone to help camouflage them. Wow!!! Am just from reading these piece.. Seriously I Have learnt a lot and I know it’s going to really help me in my makeup journey. Thanks alot!!!!! Love the instructions, simply put. Nicely explained how to use colour corrector on your skin. So far this is the happiest part of my day! I have “Vertiligo”, it’s onset came in my late 30’s. Gradually affected my face. I’ve always been a very secure and confident person, comfortable in own skin. At 52, I now want beauty! The heck with comfort. Well, do you know how difficult it is to find makeup for people like me? (Vertiligo)? My skin seems to change from one day to another. I’ve spent $ thousands $ and yet to find a resolution. Prayers and faith is what it takes! Today I read your article and knowing I’ve had a few concealer pallets, I followed your advice. This solved one, if not the most important part of the application process. Not a single so called certified makeup technicians ever tried or showed me this. Regardless, they may have made plenty of commission of me but you get the credit. Beauty my be in the eye of the beholder but now the beholders eye is the same as the beautiful. I feel pretty. P.S. Tips for people with “Vertiligo’ would be greatly appreciated. Being an older Native American Indian woman, there are so few articles to address dark circles, age spots and yes, freckles. Having taken watercolor class, color correction made sense. Glad there is makeup to address the issues we face as we age. Thank you for your article. It was fun to see results.